Danielle Wray may be missing a thumb, but it's not stopping her from doing everything she loves. 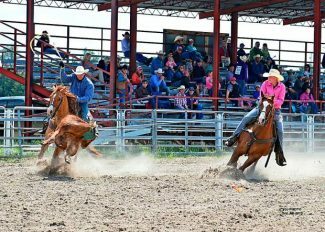 The 16-year-old cowgirl of Ord, Neb., lost her right thumb in a rodeo accident in September of last year. She was in the practice pen at her home arena, team roping with her partner Talon Mathis, when it happened. She roped a steer and got her thumb caught in the rope as she dallied to her saddle horn. The thumb was caught between the rope and the saddle horn, with the weight of the steer on it. It was nearly severed, with only a tendon keeping it attached to her hand. Mathis' dad, Jason Mathis, was quick to act. He helped her off her horse, and Danielle's mom, Denise, drove the three of them to the hospital in Ord while Jason held the hand stationary. Danielle's dad, Mark, was in Ericson, and met them at the hospital. Two hours later, Danielle was on a helicopter flight to Denver, where surgeons worked for six hours to reconnect the thumb. After it was determined that the main artery was too damaged to provide good blood flow, the thumb was amputated. After the amputation, the base of her thumb was inserted into her abdomen for three weeks, to allow the skin to grow back. After that, a soft cast was placed on the hand to protect it. Then it was as ready as it would be. This wasn't the first experience Danielle had with surgery. The avid basketball player has had three knee surgeries: the most recent to repair a meniscus tear in December, and before that, surgeries to repair ACL tears. She was shooting baskets in November, as soon as the thumb stitches healed up, but the meniscus tear kept her from playing ball. "We were waiting on her knee (to heal) before we were waiting on her thumb," Denise said. It was frustrating, at first, without the thumb on her dominant hand. She had to re-learn a lot of things, including how to hold her rope, how to write and hold a fork. The only thing that hasn't come back well is three-point shots in basketball. "I don't shoot very good threes," she said. It's not uncommon for team ropers to lose fingers or thumbs in roping accidents, and Danielle hasn't let it get in her way. She's accepted it as a fact of life, made the adjustments she's needed to, and moved on. "She's pretty matter of fact," Denise said. "It is what it is, and she just basically went to work" to overcome it. Losing her thumb hasn't scared her off from rodeo, sports or anything else. "I'm not the first person to have it happen," Danielle said, "And I won't be the last, either." She was back to roping the dummy steer before Christmas, as soon as the thumb healed up, and she was playing basketball by the middle of December. She roped a live steer by the first of February. And now that high school rodeo season has started back up, Danielle is back on the rodeo trail. Missing a digit won't stop her. "She's made up her mind, she's going to figure out how to do all the things she did before," Denise said. Danielle is a sophomore at Ord High School, and in addition to playing basketball, she is the secretary and team roping (heading) director for the Nebraska High School Rodeo Association and is a member of Ord High School's FFA chapter and the One Act Plays. 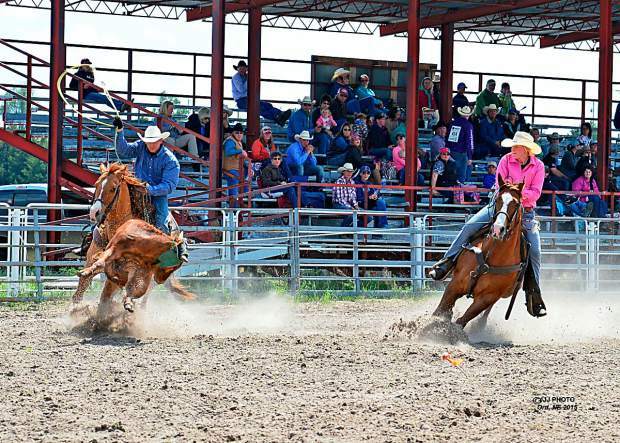 Danielle hopes to be in the top 30 contestants in each event — top 60 in the team roping— who will qualify for the Nebraska High School Finals Rodeo, held in Hastings at the Adams County Fairgrounds, June 16-18.